I have been following Michelle Heaton’s Health tips on Facebook for a while now and she mentions that she often cooks chicken using Coconut oil rather than olive oil, and I have also heard good things about Coconut water. However I have not been able to find either products in any supermarkets or shops nearby where I live. I came across the Viridian Nutrition range which contains 100% active ingredients without additives, fillers, artificial flavours, colourings, binders or coatings. Viridian Organic Raw Coconut Oil is a premium quality product made by hand in the Philippines and is certified organic by the Soil Association. This raw 100% organic virgin coconut oil is from the flesh of the coconut and since the suppliers live in the community where the coconuts grow, they ensure that the best quality coconuts are used in the production of this coconut oil. The oil can be used as a hair and skin treatment or in cooking as it’s a rich organic source of fatty acids supportive nutritionally in the maintenance of healthy skin. Coconut oil has been shown to help significantly as a skin conditioner, being rich in antioxidants and fatty acids that penetrate into the underlying tissues. It helps to reduce chronic skin dryness and aids the removal of the outer layer of dead skin cells, making the skin softer and smoother. The small molecular structure of coconut oil allows for easy absorption through the skin. 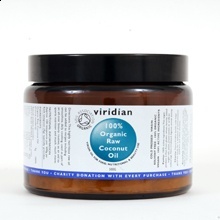 Organic coconut oil is wonderful to use as a hair conditioner as it softens the hair and conditions the scalp. The oil can be used as a pre-wash conditioner that can help combat dandruff. Coconut oil is famed for its ability to strengthen the structure of damaged, devitalised hair. Have you ever used Coconut Oil ? You are very much correct. Here in this part of the world , in India, coconut oil is traditionally used for maintenance of hair both in volume and shine. Natural coconut oil is one important beauty secret for healthy hair. You payed 14 quid when you can get it the same thing for less at £1 with even more product.